Hello Everyone we are back with a very simple but an.useful trick where we will show you how to add this CSS Transform Effects on your images when hover. This Effects works on pure CSS So it will not have any impact on your site so your site loading speed will not get effected and this will work only when you mouse over the image which you have selected. 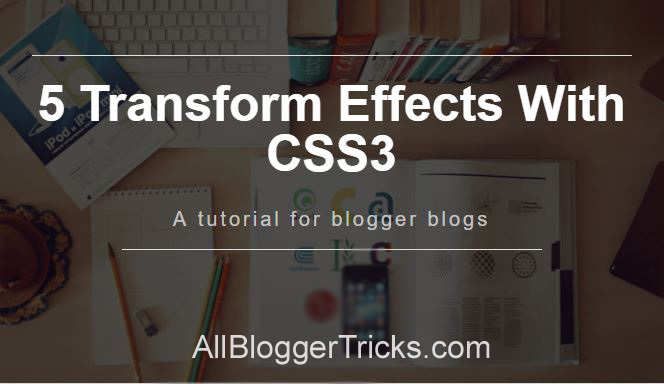 Coming back to the post, here I have 5 CSS3 Transform Effects for your blogger blogs you can add it easily to any of your image by following the below steps. If you liked any of the Effects and want to add it to your blogger blog then you need to copy the below given code of the respective Effect and paste it just before ]]></b:skin> tag. To Make it work you need to add this small html code in which you need to add you desired image URL and then it will work like a charm. Change The Yellow Highlighted Text Your-Image_URL With Your Image URL And Then Fianlly See The Effects and Enjoy. And if you want this effect on your Logo. If you want any of the effect on your Logo Image then add this class to the div or other parent Element of yout logo image which starts with ABT If you are facing any difficulty then contact us or comment here we will help you.